Have you ever heard of how people with parkison's lack dopamine? or those that suffer from alzheimer lack acetylcholine? For those of you who wander what in the middle earth those things those are, read on; for those who don't (or already know), go read 9gag instead. What is a neurotransmitter? Both dopamine and acetylcholine are what neuroscientist (or just those who care, in general) call neurotransmitter. 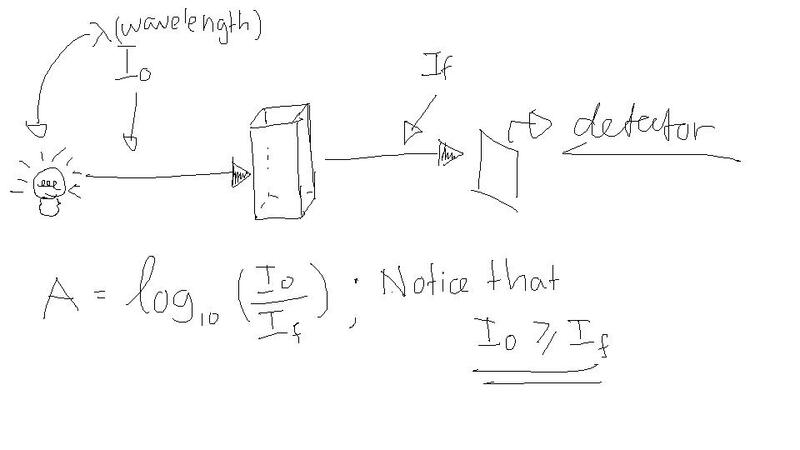 To make it easier to visualize, we can imagine a telegraph. Try to imagine a telegraph, where information are delivered electronically through wires, traveling over a great distance, but at a certain point still requires human interference somewhere in the middle to relay the correct information. Now imagine a person in point A producing a message, sending it through the telegraph cables to the operator in point B in the middle. The operator reads the message and relays it, again through the telegraph cable to point C, in which the receptor accepts the message, putting it into a (hopefully) good use. In the analogue above, The person in point A is the sensory cell, which in an organism is usually a nerve cell, producing a stimulus (message), relaying it through the axons, or neuronal cables, really!!. As the stimulus (again, message) arrives at the end of the axon (neuronal cable), it promotes the release of a neurotransmitter (an operator) which passes the message to the next axon (neuronal cable), the message was then taken further to reach person C, which is the second nerve cell (or even further ones). The actual role of a neurotransmitter is more complex than simply getting a message across; it can in fact prevent a message to get across, or reduce the ammount of message that can get across, and many other uses. At the heart of it, however, the neurotransmitter relay a certain "message" whether it's a positive, or a negative message. Neurotransmitters are very diverse, and every transmitter has its own use, whether it's activating or deactivating a neuron; they also have different uses in different parts of the brain, that is why a defficiency of one neurotransmitter could impact a lot of function. Among many neurotransmitter, Acetylcholine is a very important neurotransmitter for attention and memory creation. Acetylcholine controls the message exchange between the parts of the brain that controls attention and memory; it therefore impacts the learning function; it's not an overestimation to say that acetylcholine is what makes us such "smart" people. What happens when we lack acetylcholine? It would impair attention, and since one needs attention to form memory, it therefore impairs the memory; this is why people with alzheimers often lack acetylcholine. Many energy drinks that advertises concentration would often contain choline, a precursor of acetylcholine, and many other acetylcholoine precursor. There is, however another cheaper alternative to acetylcholine precursor. Choline is sythesized from Choline and acetyl coenzyme-A, which is the main and majority product of sugar breakdown. Since most of us will never be low on choline (usually taken as vitamin B), it is therefore better to save some money and eat sugary stuff whenever we need acetylcholine. Acetylcholine constant synthesis is also why brain requires a termendous ammount of sugar (to form acetyl coenzyme A) every single day. That is why we should not shy away from our sugars- it's what helps us think and memorize.! It has been a long long week; but one that is fruitful. 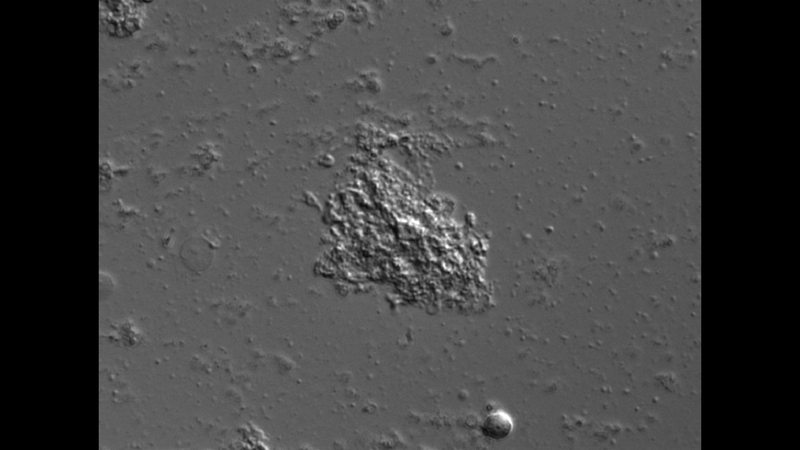 On the right is a picture of several astrocytes stained for GFAP or Glial fibriary acidic protein, which is a protein that conforms to the cytoskeleton of the cell. The green that we see, is therefore, the shape of the majority of the cell. 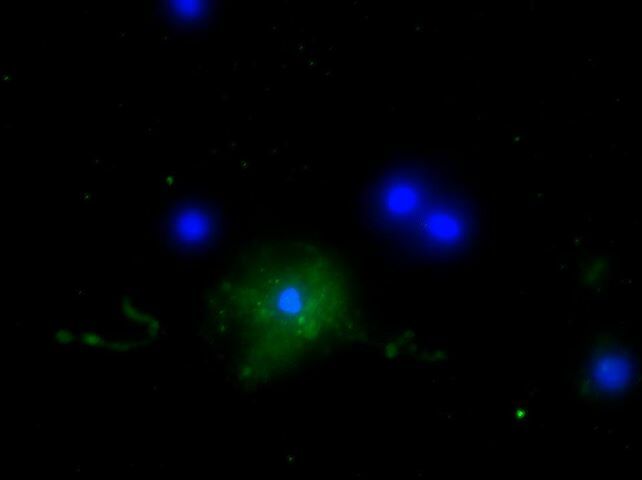 The smaller processes were not captured by this staining process due to many factors, including it being destroyed upon isolation, among many others. Cell staining accounts for one of the majority of ways to visualize a cell, whether it's a brain, kidney, or any other cells. Among the many types, one of the most used staining techniques is the immunostaining, which makes use of proteins available in the cells itself and antibodies developed against those antibodies through bioengineering. I will talk about immunostaining more after i finish my guide on proteins. I know it's taking some time, but I am working on it, and will get it done ASAP. In the meantime. 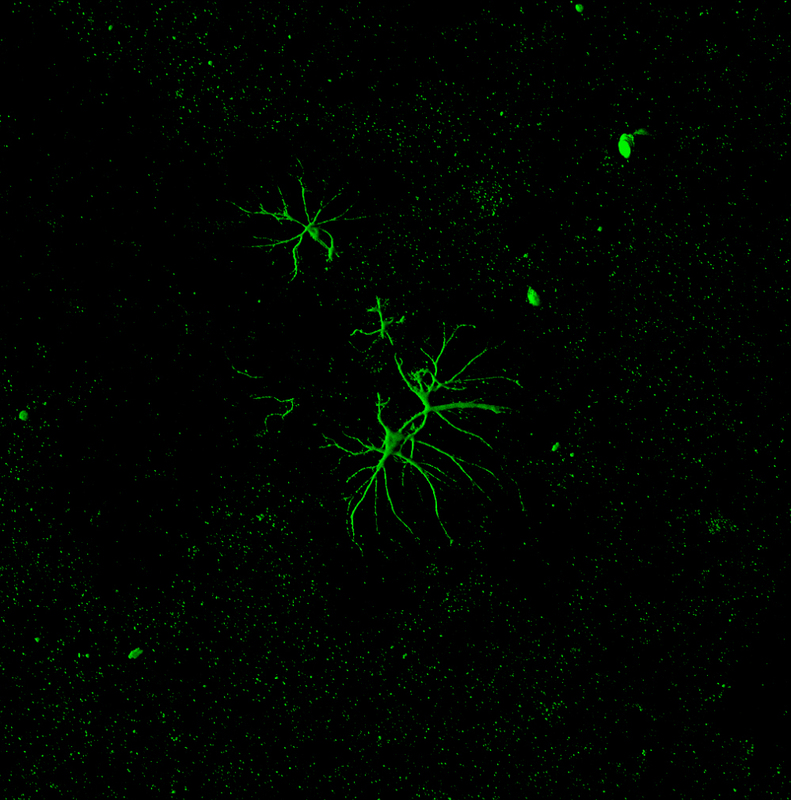 Here's one more pict of a double stained astrocyte. I am currently writing another guide for the science blog; this time it's about proteins!! what are they, and why they are so important! My goal is to make the guide as fun as possible, yet still convey an accurate picture of protein from the perspective of a biochemist. I will also work on several other topics, including: immunocytochemistry, microscopy (at least from the perspective of a neuroscientist), cancer, and many many many more. I really hope these topics will be a fun read for people of any fields. Also, if anyone wants me to write some guides in Indonesian, please feel free to ask, and I will post a bilingual version. Untill then, Enjoy! The Ohio State University is expanding its majors once more; this time to the realm of neuroscience. OSU did have a neuroscience major before, but that was a graduate studies program (NSGP, Neuroscience Graduate Program). What they are trying to add right now is the bachelor of neuroscience. The program itself is a fairly unique one, since it's a merger of three of OSU's giants: arts and sciences, psychology, and medical center. The OSU neuroscience major will encompass a broad area of studies, yet students can still specialize in one of three major areas. The three areas are: cellular and molecular neuroscience, behavioral and systems neuroscience, and cognitive and computational neuroscience. Cellular and molecular neuroscience, as its name implies, will focus mostly on the molecular basis of neuroscience; neurotransmitter, signaling pathways, ion channels and gates, action potential through voltage gated ion channel, and many many more. The cellular/molecular specialization is heavily influenced by the school of the arts and sciences (most likely the biochemistry and molecular genetics, especially after looking at the curriculum). Cellular/molecular specialization will employ beautiful arrays of biochemistry and molecular genetics classes along with its basic and grad level neuroscience classes. Behavioral and systems neuroscience will take on the tissue approach, studying the macroscopic release of neurotransmitter, and its effect on the brain; this includes the study of several diseases and abnormalities. Since the behavioral and systems specialization is heavily influence by the medical center, we can expect to see a massive amount of physiology and pathology involved in the curriculum. For those of you interested in becoming an MD, this might be the path for you, especially if molecules don't interest you as much. The specialization itself is a very strong one for many current studies on diseases; a complementary molecular approach along with the behavioral and systems neuroscience could turn out to be a very powerful tool. Lastly, the cognitive and computational neuroscience. The only school hadn't been mentioned earlier was the school of psychology, and indeed, the cognitive and computational is influenced heavily by the school of psychology. The cognitive and computational neuroscience take on the bigger question of how cognitive system function to create complex ideas such as language, arts or even music, the computational neuroscience even extends its limbs to the realm of artificial intelligence and beyond. For those of you interested in standing on the edge of neuroscience, cognitive and computational will give you the tools to forge your way through the unknown. Hinted on the previous paragraphs was the idea that one can play with the three specializations to their own needs, and indeed they can. The extra 'breadth' requirement allow students to venture outside of their specialization to obtain the tools from another; one can in fact be the master of both celullar/molecular and behavioral/systems (especially with the amount of class overlap between the two). All in all, the neuroscience major is looking very strong, and will be a great addition to OSU's library of majors. One might want to take a biochemistry minor, though just in case. The basis of most spectrophotometry is the concept in figure 1: when one inputs energy into a molecular bond, it becomes excited. To make this easier to visualize; we can assume molecular bond as a spring. The two balls connected by the spring are molecules, such as hydrogen, or any kind of molecule really; for ease of explanation, let’s call these balls and spring a system. Generally speaking, since room temperature (or any temperature above 0 K, or absolute zero) will always give the system energy bigger than 0 (through heat; since heat is basically a kinetic energy on the molecular level, we can talk about this more if you want. ), the balls and spring will always contract and expand. If energy is put into the system, it’s as if we’re pulling the two balls apart even more, therefore increasing the frequency of contraction and expansion; just like every spring we can see in life. How do we put energy into the system? In the case of Spectrophotometry, it’s most likely some kind of light, whether it’s UV + Visible light (UV-Vis Spec), Infra red (IR-Spec), or (if I’m not mistaken) a wide range, or continuum of wavelength (Atomic Absorption Spec). To make things a little easier, in figure 2 the increase in energy is represented in energy level diagram; The Y-axis represents Energy level. To go from E1 à E2, one has to put in energy. The difference between E1 and E2 is ΔE. In the case for all spectrophotometry, ΔE is always bigger than 0; that is to say that energy will always shift upwards, or in other words, excitation always happen. Since the energy source in spectophotometry is almost always light, we can represent ΔE as: ΔE = hv. ΔE = hv is the equation that relates energy to the frequency of the light; h in this case is a constant called the plank’s constant, while v is the frequency of light. But we never express light in terms of frequency you said? Correct!. We express light in terms of wavelength (nanometers; nm). To relate frequency to wavelength there’s a simple equation: v = c/λ, where c is the speed of light (3x108m/s), and λ is the wavelength. All of these equations are hard to memorize you say? Again, correct. Though E = hv is a very commonly used equation, remembering v = c/ λ can be hard. The trick is, since the unit for v (frequency) is 1/sec, and c is m/sec, and wavelength is m (or nm), in order to get 1/sec, c (m/sec) has to be the nominator (the one on the top), while wavelength (m) has to be the denominator (the one on the bottom). I hope that helps a little. Another idea is the idea that different molecular bonds require very different specific wavelength to excite. Why? 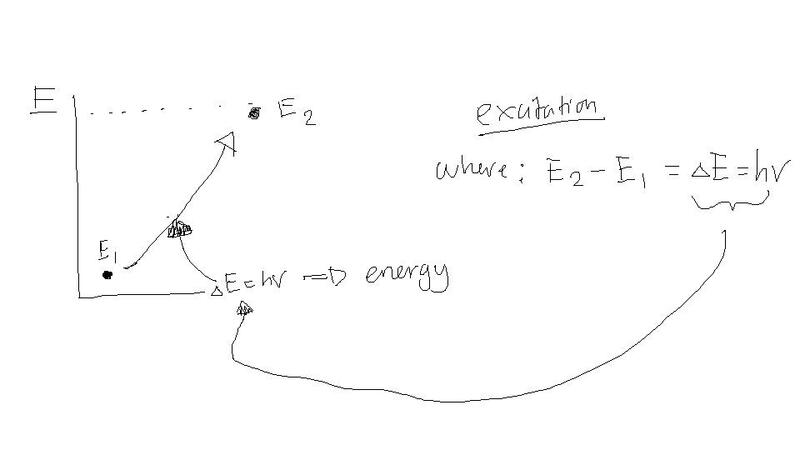 Think back to the energy level diagram; different structure excitation have a very specific energy level gap, that is the energy required to excite a specific structure is, again, very specific. And if we need a specific energy, according to E = hv, we need a specific frequency. If we need a specific frequency, according to v = c/ λ, we require a very specific wavelength; this is why different molecules require different wavelength to excite, such as 260 nm to excite DNA. Now enough of this mumbo jumbo about excitation and the planck dude, let’s move on to actual spectrophotometry. As one of the most widely used tool, not to mention the simplicity, and versatility (works for DNA, Proteins, etc2..), UV-Vis is a very very important tool to understand. It will be a little disappointing to know, however that after going through a page of that long mumbo jumbo on energy, molecular bonds, and frequency, in UV-Vis, none of those matter too much; the idea behind UV-Vis can be summarized in figure 3. 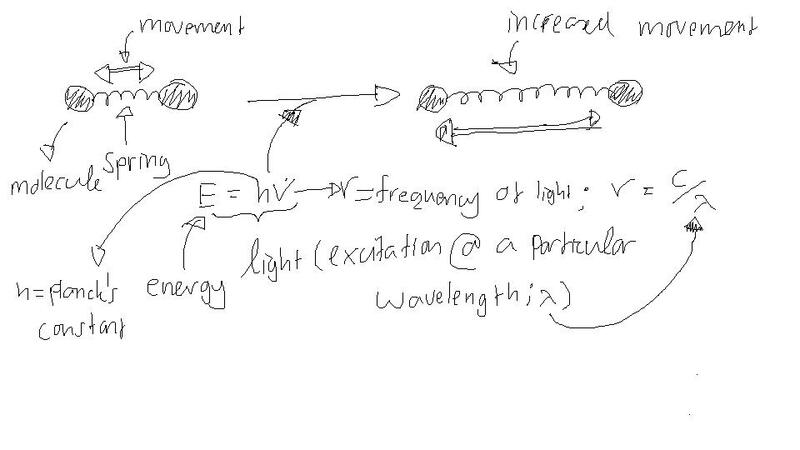 In accordance with the excitation we talked about above, when we shine light (in this case, UV and visible wavelength) towards molecules (such as DNA, or protein), the molecules will absorb the light (energy) and got excited to a higher energy level. Say we shine light into a solution of DNA (using 260 nm wavelength), the molecules will absorb the light (energy), and in the process goes up in energy level. Now the harsh reality; we do not care about how much the energy goes up (ΔE), though we can fairly easily calculate it. All we care about is how much light is absorbed, since that is synonymous to how much DNA there is to absorb the light. How do we express or quantify light? By using intensity. Simply speaking, intensity measures how much photon are hitting a surface area at a given time, A.K.A, don’t worry about it, just think of intensity as how much light there is. Since we care about how much light is absorbed, we want to know if there is any difference between the initial intensity, and the final intensity. Sadly, because the difference in this intensity can range from 0 to a huuuuge number, it is hard to express it as a difference (ΔI), we therefore express it in terms of absorbance. As in figure 3, absorbance is expressed in terms of logs of division (taking the log of a division between to numbers), this makes it easier to express numerically. Notice that since the initial intensity (Io) is always bigger or equal to the final intensity (If) (since the minimum final intensity happens when nothing absorbs the light, therefore is equal to the initial intensity), the ratio between the two (Io/If) is always bigger than 1. Therefore, absorbance is always bigger than log of 1, or always bigger than 0; it means that the lowest absorbance is always 0 and never negative; see? Expressing it in terms of absorbance makes it a lot easier! A good practice: IF the absorbance is 0.1, what is the ratio between Io and If? Does it mean that the solution contain (approximately) a lot of a particular molecule? What if the absorbance is 2? What percentage of the initial intensity is absorbed in each case (when A = 0.1 and A = 2)? Now that we know what absorbance is, how do we use it??? Now comes the two drunken master by the name Beer and lambert; they came up with beer-lambert law. Simply speaking, beer lambert law is just a way to figure out the concentration of a molecule in a solution if the absorbance is known. Beer lamber law is: A = e l c; where A is absorbance, e has a lot of names but one of them is extinction coefficient (some call them the molar absorbtivity), l is cell (tube) length, and c is concentration in Molars. But if we want to measure the concentration, not only do we have to measure the absorbance, but we also have to know the extinction coefficient for the particular molecule (remember that every molecule is different!). Thankfully, the extinction coefficient is calculated empirically, or through experiment; we can find the extinction coefficient for many molecules used in research in a lot of manuals, internet, and the memories of good professors. Say we are measuring the concentration of a DNA solution, using a cell with 1 cm thickness. By asking our good ol’ professor, we find out that the extinction coefficient for DNA is 0.030 (μg/ml)-1 cm-1. Now we can simply take around 1.1 ml of the solution, pipette it into the cell, and take the reading. We found out that the absorbance is 0.5. Can we calculate the molarity? Hell yea. In fact, the professor is nice enough to give us an extinction coefficient that is already in μg, so we don’t have to calculate the mass of the DNA from the molarity (which can be very very very very hard, unless we use approximation). Isn’t UV-Vis nice? As we see, UV-Vis cares not about the Energy absorbed (though, technically the energy corresponds to the wavelength, but we can find the list of wavelength for most molecules, again, in books and the interwebz), it cares only about the intensity. Heck, most UV-Vis now don’t even tell us the intensity anymore, they just display the absorbance, and makes the process a lot quicker. Even Heck-er, some UV-Vis can just calculate the concentration by us telling it the extinction coefficient, so that we don’t have to do anything anymore. But still, the science behind the equipment is fun AND informative, so why not learn it? Not to mention it’s easy too. Now UV-Vis goes deeper than this, but that’s for another day. There’s the fact that UV-Vis is additive (we can just add the absorbance to get the concentration, since it’s linear) and the optical rotation spectrophotometry, which is basically just UV-Vis but uses an extra concept. For now though, I think we can safely say that we are UV-Vis Wizards now. Being a biochemist of no specialization (yet), I see myself as more of a lab rat. I didn't think of it much until a friend of mine asked whether I wanted to come with him to gather DNAs and seeds from his soybean plants. 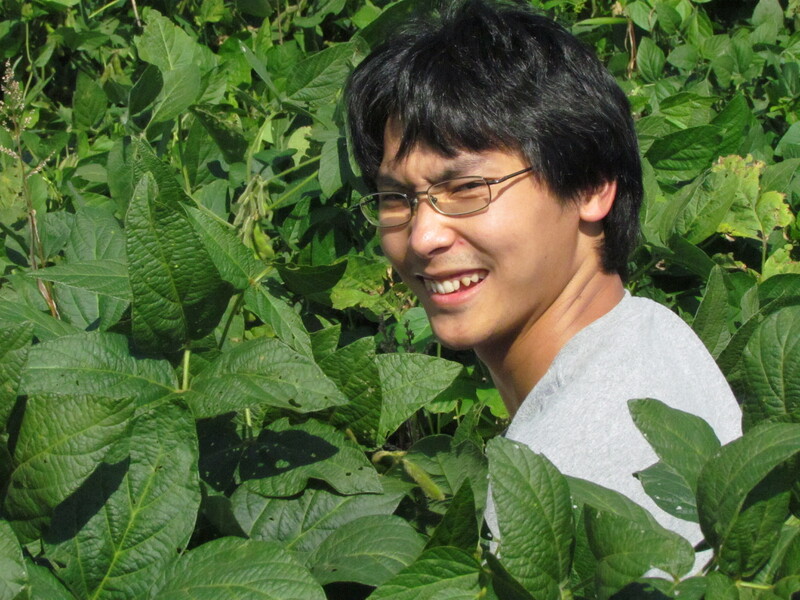 The soybean research farm is owned by Ohio State University, acres and acres of it. Most of the fields are planted with either soybean or corn; and it was in all true meaning of the word, awesome. Living in Columbus for 4.5 years now, I don't see much of the countryside, even less the greeneries that comes with it. We drove to New Vienna, Ohio, across the small town, seeing banners of corn festivals along the way; it was exciting, despite the silence that came with the village. The lands were covered with tonnes and tonnes of soybeans and corns, each with different varieties from different companies. It's hard not to imagine sleeping on top of a bed of greeneries seeing all those produce. 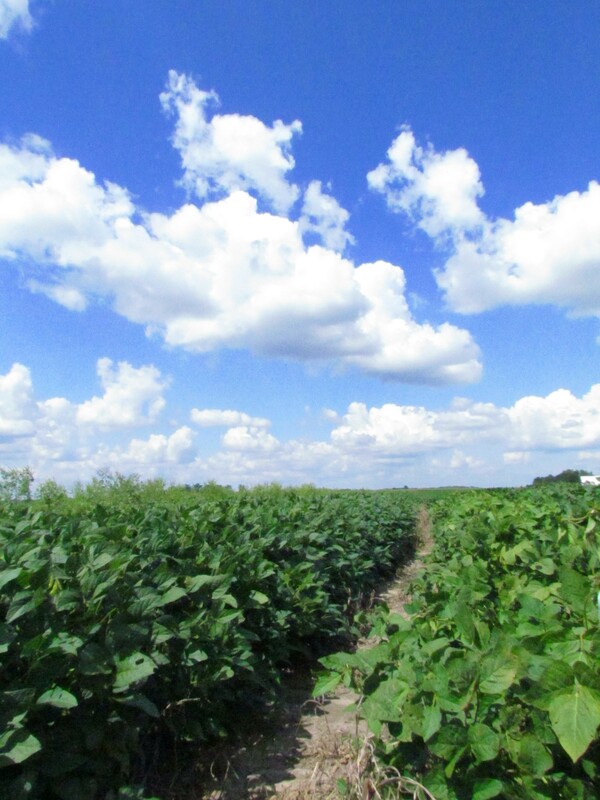 When we arrived at the designated plot where my friend's soybeans were planted, I took a picture of the field. No, actually I took a bunch of photos, and all came out looking wonderful just due to the view itself. Blue skies, white clouds ,and green across the lands; it made me hungry for healthy food, unlike those that I've been eating all these times. As my friend rustled through and into the soybean plants, plunging deep into the greens, I stood up, right smack in the middle of the soybean forest, feel the breeze, the sounds of crickets, and the rustling of the leaves, and I began to understand a little bit why some adores the farmlands so much. As exciting as they are, the labs I worked in felt cramped and one colored compared to the fields. I might not switch to plant pathology, but I sure can enjoy spending my time with one in his open air lab.